“Let’s imagine that there is a small camera somewhere in the middle of the field. We leave the camera in the same spot for a long time, say for several years. What can we see in that picture? What would nature create over time? Would it contain images of leaves, wind, petals, blooming and fading flowers, dust and dirt? Can we see any traces of sunshine or fog? Rain or mist? Can we still hear the music that an artist loved to listen to? Can we feel the joy or distress of that artist? That is my work. My art is a record of time, space and nature: a record of life. 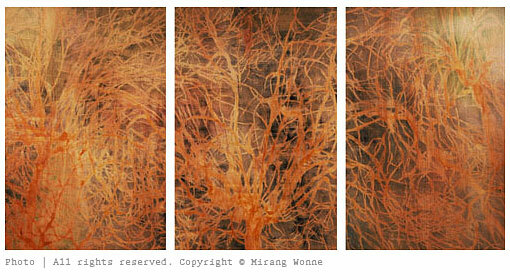 You see the flowers in my painting, although you are not sure whether those flowers are blooming now or faded long ago. Many flowers overlap; were the flowers blooming together or did they bloom in separate times? You find some familiar petals while other petals are crushed and dried to specks of dust. Are they gone already or are they still here? This is the image of the “life” I see. To me, life seems like just a short dream or a never-ending illusion. I try to depict this through my art. Sometimes life is so beautiful that it blinds my eyes. I see extraordinary energy around me. Then, at one blink of an eye, whole pictures disappear into abstract blankness. I can no longer see the petals, colors and sunshine. All I see is emptiness and a memory of what was once there. I see the instantaneousness of life. My work is about the visual interpretation of this fragility and illusion of life. I see its beauty so clearly, but I can never hold onto it concretely. It is like trying to catch moonlight or a dream. The image of life at first becomes stronger and more vibrant to the point that it appears to be permanent? However, as soon as I think that I am holding it, it disappears like a dream.